With the presence of a large pool of participants, the global food hydrocolloids market is displaying a highly competitive business landscape, finds a new research report by Zion Market Research (ZMR). E. I. du Pont de Nemours and Company, Cargill Incorporation, Lubrizol Corporation, CP Kelco, Rousselot S.A.S., and Ashland Incorporation are some of the key vendors of food hydrocolloids across the world. These players are focusing aggressively on innovation, as well as on including advanced technologies in their existing products. Over the coming years, they are also expected to take up partnerships and mergers and acquisitions as their key strategy for business development, states the food hydrocolloids market study. Citing an instance, in June 2017, Alland & Robert – a reputed firm with expertise in natural plant exudates- decided to introduce clean label hydrocolloid solution of Syndeo range. In October 2017, TIC Gums and Ingredion signed an agreement offering wide spectrum of texture abilities along with exceptional formulation expertise and real-time response to end-user needs. As estimated in this report, the global food hydrocolloids market stood at US$ 6.57 billion in 2017. Witnessing a tremendous rise during the period from 2017 to 2024, the revenue in this food hydrocolloids market is expected to reach US$ 9.12 billion by the end of the forecast period. The main types available in this food hydrocolloids market are gelatin, Xanthan, carrageenan, alginate, agar, pectin, guar, locust bean, gum Arabic, and Carboxymethyl cellulose. Among them, the demand for gelatin and carrageenan is relatively higher and the trend is anticipated to remain so over the next few years, notes the food hydrocolloids market research report. “Wide spectrum of product applications witnessed in bakery & confectionery, sauces & dressings, dairy items, meat & poultry, and beverages are anticipated to boost food hydrocolloids market trends,” says the author of this study. Apart from this, the product also finds lucrative applications in cosmetics and pharmaceutical sectors. This, in turn, is likely to generate lucrative avenues for food hydrocolloids market in the coming years. In addition, large-scale intake of processed food products is the major factor driving the growth of food hydrocolloids market. Regionally, North America has been leading the worldwide food hydrocolloids market and is anticipated to continue on the dominant position in the years to come, states the food hydrocolloids market study. 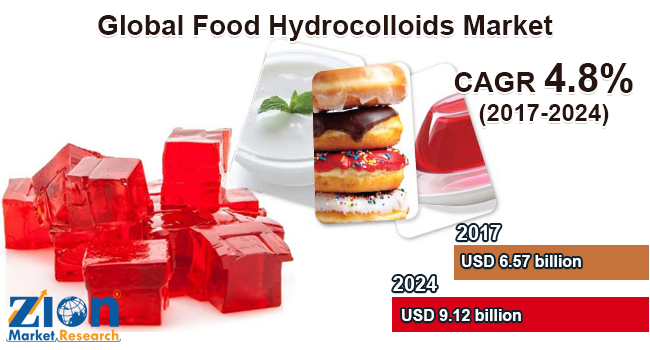 Drastically altering consumer lifestyles, changing food habits, and inflating working population leading to enhanced consumer demand for the product are the key factors behind the dominance of the North America food hydrocolloids market. The high number of market players being headquartered in North America is another significant factor that is supporting the growth of this regional food hydrocolloids market.